A ‘night guard’ (occlusal appliance) is a thin piece of hard plastic made from impressions of your teeth that is placed on the upper teeth. The night guard is hard enough to be durable but it is softer than teeth and protects them from wear. A night guard protects your teeth and jaw from the detrimental effects of nighttime teeth grinding. The pressure created by grinding can eventually wear your teeth down to nothing! Other warning signs that you may be grinding your teeth at night include headaches (sometimes severe) and jaw pain when you wake up in the morning. In a multi-center trial of the NTI device, 82% of sufferers had a 77% reduction within 8 weeks. From my experience in the dental field, I have seen an increased number of patients with tooth wear issues. Grinding or ‘clinching’ is present in a high percentage of people. This behavior can be caused by a nerve triggering muscles during sleeping, or a bad habit that people develop during stressful moments. • Significantly decrease the wear of patient’s teeth. • Significantly reduce the deterioration of patient’s restoration, preventing chipping and wear. i.e. : crowns on implants and molar restoration are more susceptible to fracture and chipping than natural teeth. 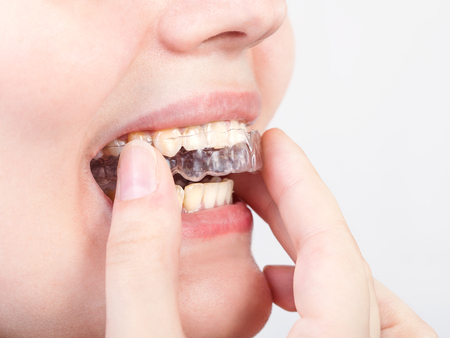 A custom-made ‘night guard’ appliance is made of a hard acrylic. This appliance not only protects the teeth from wearing, but also can modify the patient’s occlusion. There are ‘generic’ over-the-counter appliances available, but all of them are made of a soft material, so its use is limited. Modification of the occlusion offers the ability to control the activity of the muscles used for chewing. For example, studies have shown that canine tooth contact due to lateral jaw movement (right to left), decreases muscle activity. On the other hand, group function or the contact of premolars and molars in lateral movement, significantly increases the activity of the muscles used in chewing. Molar teeth are not meant to touch when the lower jaw is moving from right to left, for their shorter roots are not made to support this type of contact. The constant lateral contact in these posterior teeth will cause an increased chance of bone deterioration and of developing gum disease. Other studies have shown that ‘soft’ night guard occlusal appliances significantly increase muscle activity, making these issues worse. I believe a custom ‘night guard’ occlusal appliance is very effective and a preventative service. I highly recommend them to my patients. Call us to schedule an appointment at (440) 975-9885, and get started on the path to healthier teeth today!